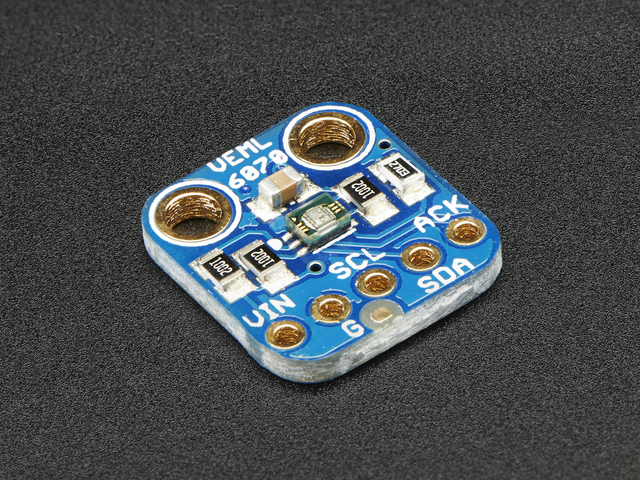 This UV sensor works great with 3 or 5V power or logic, its nice and compact, and its easy to use with any I2C-capable microcontroller. Each order comes with one assembled PCB with a sensor, some handy pullup resistors, a 270K rset resistor and a small piece of header. Some light soldering is required to attach the header but its a fast task! This guide was first published on May 16, 2016. It was last updated on May 16, 2016. This page (Overview) was last updated on Apr 17, 2019.